Cyclone Feed System can provide 15+ balls per second to the gun. Push Pin design for easy cleaning and maintenance. Powder coated, aluminum die cast receiver for unquestionable durability. Fully compatible with compressed air, nitrogen, or CO2. 200 Round (or larger) hopper included with all paintball guns and packages. All the great features of the 2011 A5, as well as the new H.E. E-Grip preinstalled. Includes RT trigger already installed, capable of shooting up to 15 balls per second. New version of the A5, features all 2011 upgrades and comes with a low profile hopper. .
A5 E-Grip with an HPA tank and a mask. 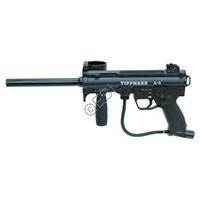 Tippmann A5 VS. Tippmann 98: The Tippmann A5 is the next generation of paintball guns after the Tippmann 98 with a few major differences. The Tippmann A5's have a Cyclone Feed that virtually eliminates jams. Due to the large opening of the Cyclone, it eliminates jams in the feedneck that can happen on the 98 Custom and any other small feed neck gun. Tippmann has also made the gun more accessible by including pushpins for commonly removed items. Rather than completely disassembling the marker like on the 98’s, you can now remove pushpins to access your internals to lubricate or fix a problem, or change stocks and grips. The internals of the Tippmann A5 gun are very similar to the 98 Custom with the exception of the A5 Tombstone.The tombstone is a piece that lets air in to the valve body. The Tombstone on the A5 allows for easier disassembly and gives you more upgrade options. The Tippmann A5 now has completely enclosed internals. The 98 Custom had its cocking handle connected to the hammer, which exposed your internals to dirt, paint, and other debris. The gradual threading of the A5 barrels requires more turning to remove the barrel. This creates a tighter fit and it is much less likely to unscrew. Lastly, there are many more upgrade options when you choose the Tippmann A5, and many of them are easy to install with the quick release pins. For the extra money, the Tippmann A5 is a big step up from the 98, and is well worth price. Tippmann A5 VS. Proto Rail: Both of these guns are great for starters but they have major differences that need to be considered. The Tippmann A5 is a mechanical marker while the Proto Rail is an electronic marker requiring batteries. The A5 can shoot as long as you have air, and because there are no electronics it can operate in the rain. The Rail can operate more efficiently due to the lack of a blowback re-cocking system, which uses more gas. The rail is best served using HPA instead of Co2, while the A5 can use either. High pressure air (HPA) is not available everywhere and many players will use CO2 due to the lower prices and availability. The Rail has a higher rate of fire unless you upgrade the Tippmann A5. You have the option of upgrading to a Response Trigger or E-grip to achieve about the same rate of fire. The A5 uses a lower profile hopper while the Ion uses a regular style vertical hopper. The A5 comes stock with the Cyclone feed system and doesn’t require any upgrades. The Proto Rail does not come with a hopper, and needs an electronic hopper upgrade to keep up with its high rate of fire. The Tippmann A5 is made of thick aluminum and will withstand whatever you can throw at it (Or run over it with). The Rail’s have a composite frame which is thinner and lighter but much less durable. Due to the way the gun was designed, the A5 has many more accessories available to it. While each gun is better suited for different play styles the advantages of the Tippmann A5 make it a better value than the Proto Rail. 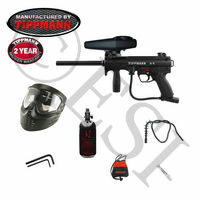 Which Tippmann A5 is right for me? The first thing to remember is that all A5's start with the same gun. The differences from model to model are the color, accessories, and type of trigger/grip frame that are on the gun. The gun itself does not change. 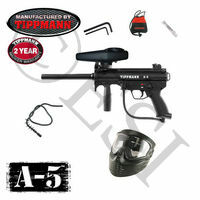 Tippmann A5 Pre 2011 VS. Tippmann A5 2011: In 2011 the A5 recieved a few updates, making the A5 a better value than ever. The 2011 A5 offers a selector switch safety. Instead of the push button the older model has. The selector switch makes it easy on the electronic A5's, to switch from fully auto, to semi with just the flip of the switch. Tippmann changed the gas line on the new 2011 A5's. The older models had a silver braided hose, while the 2011 models have the same hose, but covered in a black rubbery material. Included in the 2011 A5's packaging is their low profile cyclone feed hopper. This hoppers body is much smaller than previous versions. The newer A5's come with a bit better of a barrel. The front grip on the new A5's was designed with comfort, as well as aftermarket upgrades in mind. Now the hand guard is a part of the foregrip, and can be removed when the foregrip is removed.This makes it much easier to upgrade to a fake magazine, or different foregrips. The cyclone feed also was updated. The 2011 A-5s come stock with softer plastic paddles, making jamming and paint breaks a thing of the past. 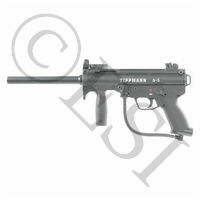 The basic Tippmann A5 comes in black. All A5's, will include a hopper that fits on it's Cyclone Feed System. The A5 basic trigger is a mechanical semi-auto trigger. The gun will fire as fast as you can pull the trigger. You do not have to recock or pump the gun each time. While the gun can shoot as fast as you can pull the trigger, most people can realistically shoot between 3 and 9 balls per second. You might personally do better or worse but that's what practice is for. The single finger trigger has a nice clean and light trigger pull. The A5 RT includes an RT kit, also known as a Response or Reactive trigger. A Response trigger is still a mechanical, semi-auto trigger, that will shoot as fast as you can pull it. However you're going to get some assistance in the trigger pull. Some of the air from each shot is re-directed to a small piston behind the trigger shoe. This piston kicks the trigger back in to a ready firing position after each shot. What this does is it resets the trigger, for the next trigger pull, even before you've let your finger off of the trigger from firing your previous shot. Now follow this . . . If the trigger returns to a ready firing position before you've let off the trigger, you're still pulling on the trigger, then won't you shoot again? YES! There is a sweet spot in the Response triggers. When you pull at a consistent pressure that is strong enough to fire the gun, and weak enough to keep the RT from kicking the trigger back to ready, then you'll effectively be able to shoot in bursts or even full auto with a mechanical semi-auto gun. Now this does take practice but it's not hard to figure out. After a couple of times out with your gun you'll get the hang of it and easily be able to shoot 5 to 15 balls per second. Tippmann A5 E-Grip (No Longer Available) - While this is no longer an option avaliable from Tippmann, you can still easily upgrade your Tippmann A5 into an E-Grip. Check this page for E-Grip upgrade kits. Ergonomic grip, with comfortable finger grooves styled after the famous HK line of firearms. Safety is a simple cross-bolt style and is quiet and super smooth. Five firing modes with up to 17 ball-per-second capability. Upgradeable to the popular APE or Virtue boards for increased performance and customized firing modes. Compatible with all brands of gas-thru mag kits. Uses commonly found 9-volt batteries. Selector switch allows you to change firing modes on the fly . . . Anytime, anywhere. Weather-proof body housing helps protect your valuable electronics. Easy external access battery panel makes changing batteries a snap. No removal of the grip necessary. Five firing modes with up to 20 balls-per-second capability. Upgradeable to the popular APE board for increased performance and customized firing modes.